Bangkok is like Marmite - you either love it or hate it - and for me I absolutely love it. It’s a place I spent a lot of time exploring many years ago as a backpacker, drawn by the vibrancy and intoxicating culture of the city. That was over 20 years ago and since then I’ve passed through Bangkok Airport on many occasions with the odd fleeting visit into the city and it was only recently that I lingered longer and I have to say, the City of Angels didn’t disappoint. It has now transformed into a thoroughly modern city but it also stays true to its traditions and strong Buddhist beliefs; soaring skyscrapers and climate-controlled megamalls sit alongside colourful temples, mesmerising royal palaces, streets lined with food carts, long tail boats plying the river as they have for many years. If you think that Bangkok is nothing more than a fume filled city clogged by traffic and tinged with the sleazy reputation brought on by the floorshows of Patpong Road, think again. Yes, these elements exist but, Bangkok really is more than that and with so much of life conducted on the streets, there are few cities in the world that reward exploration as well as Bangkok, even if it is just for 24 hours. The main attraction in Bangkok is theGrand Palace and it has to be top of your list as it’s one of Thailand's most impressive sights; do leave plenty of time though as it’s a vast complex. The architecture spans 200 years and there are more than 100 buildings and temples (or wats) within the grounds including the dazzlingly-tiled Wat Phra Kaeo temple, home of the most-holy (but surprisingly small) Emerald Buddha and the imposing gold and jewel clad royal palace (although the king is no longer in residence). Another impressive temple which is close by is Wat Pho;originally built in the 16th century it contains colourfully tiled chedis, pretty murals and it’s most famous of residents, the 45-metre golden reclining Buddha which, like Buddha-nature, can’t be captured whole from any one angle. 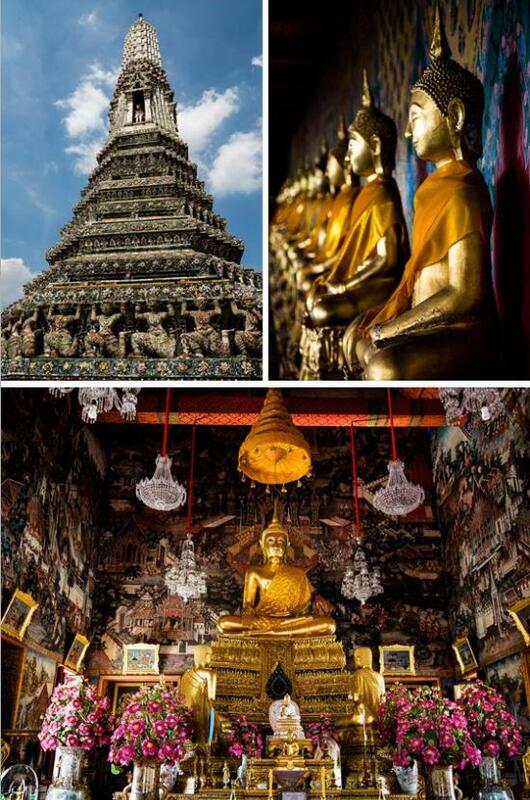 Whilst visiting Wat Pho you must give weary feet a rest at the legendary Thai massage school. However, my out and out wat winner is Wat Arun which sits across the river from the Grand Palace complex. It’s dominated by a soaring 70-meter-high elongated prang (Khmer-style tower) from which you get wonderful views of life on the Chao Phraya River. Surrounding the main prang are four smaller prangs, each one beautifully decorated with tiny pieces of coloured glass and porcelain; Wat Arun is known as the Temple of the Dawn because of the way the light reflects off its ornately decorated surfaces. 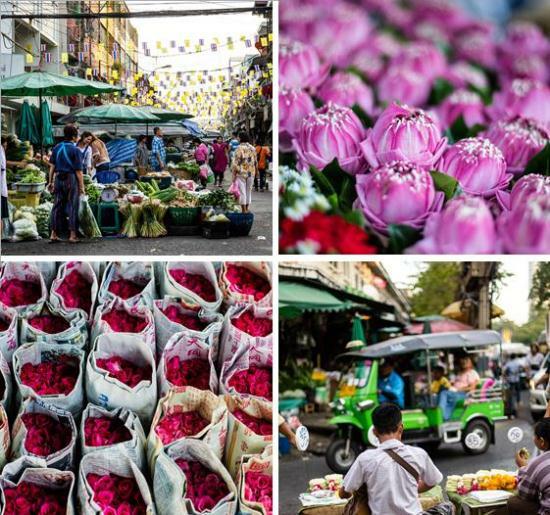 For a visual feast of a different sort, wander through Pak Klong Talad, Bangkok’s best known flower market which resides on the edge of the atmospheric Chinatown. Here you’ll see every conceivable exotic plant and flower that Thailand has to offer. The market comes to life after dark when the city’s flower sellers congregate to buy the next day’s supplies. Luckily the fake goods that covered street stalls in my day as a backpacker are most definitely on the wane and in their place the shopper’s paradise comes in the form of the upmarket malls around Siam Square, full to the brim of every conceivable designer label and some very hip local talent as well. If you like to conduct your shopping market style then head to the undisputed king of Bangkok's markets, Chatuchak (or simply JJ as it’s fondly known). This weekend market is vast with around 15,000 shops and stalls spread over 35 acres - it’s great for anything from clothes and antique curios to live snakes! Despite its size, you'll be up against hundreds of thousands of visitors so go prepared! At night, there is definitely no need to go anywhere near the neon-lit strips of sleaze that is Patpong - and believe me, it really isn’t worth it. Bangkok’s celebrated evening scene is sophisticated and more about cool skyscraper bars and design-conscious clubs than go-go bars. We started our evening with skyscraper sipping at the Banyan Tree’s Moon Bar; after jostling for space we spied a coveted couple of stools and perched with our cocktails taking in the sublime night time view over the whole of the city. Then it was on to dinner and this is where I get excited, as Thai food is my all-time favourite; from cutting edge restaurants to the humble street stalls the food is delicious. We decided to go all out with Michelin Star dining at Nahm - voted as one of the top 50 restaurants in the world, we indulged in authentic Thai food at its best. If spicy Thai food is not for you then fear not as Bangkok is a gourmet’s delight with options for all tastes and budget. Don’t even think about taking a taxi in Bangkok (except to and from the airport) - the roads are so clogged that you need the nippiness of a tuk-tuk to weave in and out of the stationary traffic. Yes, a ride in a tuk-tuk can be hair-raising and yes you do end up paying more than a metered taxi but, it’s the quickest way to get around and there’s nothing better than experiencing the hurly-burly of taxiing in a tuk-tuk! Another must is to see the city from the Chao Phraya River; due to its network of canals the city was once known as the Venice of the East. You can hire your own long tail boat, but the cheapest way is to ply the river on one of the water taxis, cramming yourself on with locals and tourists alike. Alternatively you can get a new perspective on Bangkok with an organised cycle tour of the old city which takes in panoramic views, visits to small local communities and finishes with sunset at Wat Arun. Over the last 20 years I’ve seen Bangkok evolve into a thoroughly modern city but despite this race towards the future, it’s never lost its Thai-ness. If you’re travelling east and have to fly via Bangkok, then I really do urge you to plan a stop-off in the city, even if it’s just for one night. You’ll be rewarded with a fascinating, intoxicating and chaotic place, brimming with sights, smells, culture, noise and excitement; an exhilarating attack on the senses. If you’re interested in visiting just Bangkok or are planning a wider trip to Asia then please feel free to get in touch with me, I’d be happy to chat through some travel ideas with you.